The San Antonio Missions were created by the Franciscan Order in the 18th century to evangelize the indigenous Coahuiltecan population and create settlements loyal to the Spanish. They are located along the San Antonio River in Texas. It shouldn't have been a World Heritage Site that made me finally get around to visiting San Antonio, but I'm afraid the relatively newly-inscribed San Antonio Missions were the impetus for my visit last December. Well, that and the opportunity to see the San Antonio Riverwalk at Christmastime. 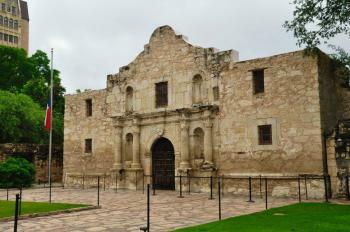 The only mission most Americans are familiar with is the famed Alamo, where the American folk legend Davy Crockett died in a Mexican massacre during the 19th century Texas Revolution. While the Alamo excels in telling the story of the revolution (and indeed, re-enactors and a Mexican army bivouac were in place the day I visited), the older history of the San Antonio missions can be found at Mission San José, one of the four missions south of San Antonio. The churches of three of these four missions are open for tourists; I particularly appreciated the intimate interior of Mission Espada. The goal of these Catholic missions were to evangelize the native Indian population, after which the missions were turned over to the Indians. Their history reminded of my visit to the Jesuit training college museum in Tepotzotlán, Mexico, earlier in the year. The buildings of each of the missions have been kept up well over the past 300 years, and I highly recommend taking time to wander each of their grounds. 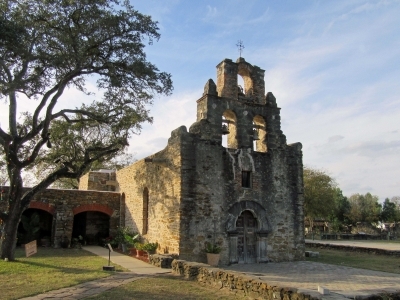 Logistics: The San Antonio Missions are connected by a fifteen-mile trail, as well as by a public bus route; there is also parking at or near each of the missions for those who choose to drive. Technically this was the first UNESCO site I ever visited, on a road trip when I was 8. However, I barely remember it, and it wasn't inscribed until 2015, so I was happy to get the chance to revisit last week and also see the rest of the missions. I went to all five missions in about 5 hours, using a rental car to get from place to place. I was pleased to have the vehicle since it was blazing hot. Having grown up in Oklahoma, I've been to southern Texas approximately one million times, but I am never mentally prepared for the heat. This chain of missions alongside the San Antonio river are amongst the finest examples of Spanish Colonial architecture in the United States. Unfortunately, these historic structures are all overshadowed by the Alamo, which has become part of American (and Texan) folklore. "For the Alamo, the site was hard to explain since it has long been converted into some kind of national shrine of heroic battle for Americans." Frederick's statement here is accurate. Almost every adult aged American has heard of the Alamo, but few actually know much about the missions themselves. Millions of Americans visit San Antonio every year, yet few actually visit the chain of missions that are the origin of San Antonio. Part of this American folklore is national, but much of it is specific to the "Republic of Texas". In fact, Texas was an independent country from March 2, 1836, to February 19, 1846, they had 5 different presidents over that period and set up embassies in Europe. Part of this Texas independence "spirit" is why the Alamo overshadows the rich heritage represented in the San Antonio Missions. I didn't bother with the Alamo. Personally, I was satisfied by visiting the exterior for about 5-10 minutes. I have little interest in the battle, because I've heard plenty during elementary school. 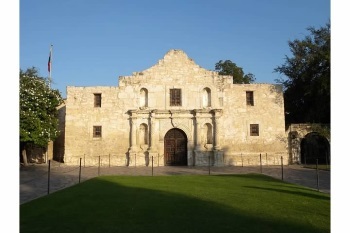 The Alamo itself adds little to the WHS, and ICOMOS expressed concerns over the inclusion/autheniticity of the site several times in their evaluation. In the end, it was added more for completion purposes and to satisfy Texans who wanted it inscribed. Enough about the Alamo. The missions run by the national park service are the true gems of San Antonio. Logistically, these missions are noticeably easy to visit. You don't even need a car to visit all of them! A rare occurrence in the US! The San Antonio river and surrounding parklands are connected to each mission by walking and bike paths. Thanks to an excellent bike rental system (B-Cycle) throughout San Antonio it is a comfortable and scenic bike ride to ALL 5 missions and the Espada Aqueduct. The bike ride (which is not strenuous) was fantastic, the paths and bike stations are superbly maintained. I was pleased to enjoy the river while visiting every mission in 20-25 minute intervals. Mission Concepción and Mission San José are the key missions to visit along the route. They are the most compete and impressive of the San Antonio Missions. Mission San Juan and Mission Espada are interesting, but there is considerably less on view. 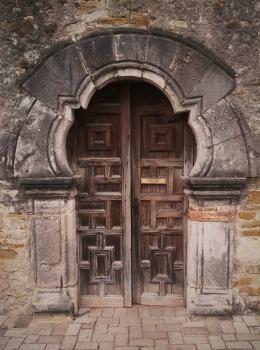 I did however enjoy the wonderfully unique door at Mission Espada. 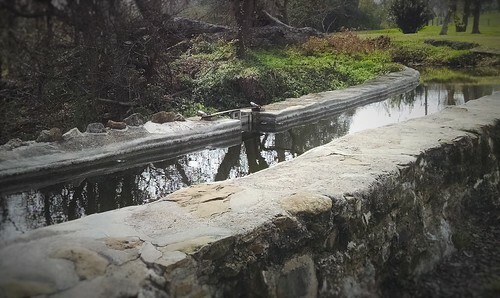 The Espada Aqueduct (1745), which is the oldest Spanish aqueduct in the United States is also worth a visit. The history mixed with a very pleasant bike ride will please most visitors, even if they already visited many representative examples of Spanish architecture. Final thought. How do the San Antonio Missions compare to the missions in California, Arizona, or New Mexico? I found some of the interiors of Californian missions more impressive than their counterparts in San Antonio. I also found Mission San Xavier del bac in Tucson to be the most beautiful. The adobe missions between Santa Fe and Taos are memorable and unique. However, while some of the missions in the Southwest are equally impressive, in some cases more so, I think what make the San Antonio missions special is their concentration along one river and their completeness as a functioning whole representing the successful colonization of this particular region by the Spanish crown. The 5 Missions of San Antonio are just one of the few extraordinary sites that are a must see while visiting San Antonio. 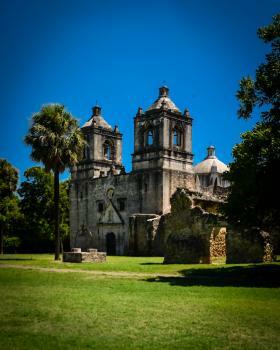 I am a native San Antonian and visit the missions quite frequently. There is always something to photograph and am grateful to have these sites in my backyard. Read more from Ronnie Sul here. Remember the Alamo and don’t forget other four missions is maybe the words that will be in every tourist magazines of the lovely city of San Antonio especially after June 2015 when finally the San Antonio Missions become the first World Heritage Site for Texas. During my 2 days visit in this nice city, apart from the famous scenic River Walk, I did manage to visit 2 missions after saw advertisement and articles about San Antonio Mission National Historic Park in almost every free magazine I read in the hotel. After consulted with hotel concierge and very tight schedule, I decided to take a taxi to visit Mission San Jose which reputably to be the largest and most beautiful of all missions. The driver took me into the small street that looked like a road to someone house, and suddenly I found the large carpark area and a high wall church in partial ruined next to quite imposing stone gate. I walked around the church until I saw the very impressive front façade. The whole façade was adorned with elaborate baroque cravings statues and motif. The wooden door was also lovely to admire. Another impressive work of art was the Rose Window which located just behind the corner of the front facade, its lovely shape and motifs were quite something to see. After that I walked around the church that surrounded by large lawn and stone wall similar to small fort or military barrack. Then I took a bus Line 42 backed to downtown to see another mission, Mission Valero, which was better known as the Alamo. The atmosphere of San Jose and the Alamo were totally different, at the Alamo there were load of tourists, long queue (even has commemorative photo booth in front of the entrance! ), and I felt like I was entering some kind of theme park. At first I was quite surprised to find that the place was really small, and looked very unauthentic with reconstruction of interior. Inside there was a display of Battle of Alamo, here I was again very surprised to learn that the Alamo was already in ruined with no roof at all even before the battle! I always misunderstood that the Alamo was destroyed by the conflict. After the main building, I entered into the souvenir hall; the Alamo was indeed very well planned to get tourists’ money. Then I walked around the garden and backed to the entrance where I stopped to admire some fine decoration at the façade. In the next early morning I decided to come back to the Alamo again for much peaceful moment and nicer photo opportunity. After saw Mission San Jose, I was quite surprised to myself that the site was better than I original thought and to be listed in the World Heritage Site was agreeable, at least the façade of San Jose was far superior than many other Spanish churches that I saw during my visit in Texas and New Mexico, and that the area bigger than Italy and France. For the Alamo, the site was hard to explain since it has long been converted into some kind of national shrine of heroic battle for American, not the heritage Franciscan mission. I was not surprised to see some nationalists afraid of UNESCO as the Alamo was quite a unique site in their opinion. Anyway I was really happy to visit San Antonio, this city was one of friendliest big American cities I’ve ever been, a really good place to be in Texas whether with World Heritage Site or not. Controversial museum plans: Alamo Plaza - "$110 million will be used to renovate and repurpose three buildings (owned by the state) as a museum"